Collection of theological and polemical treatises. Late 17th century copy by Moses Raphael d’Aguilar (d. 1679). f. [1a]: Table of contents. f. 1r-5v: Tratado da immortalidade da alma. Treatise on the immortality of the soul. Text in Portuguese. f. 6r-24v: Preguntas que se me fiz erão de Anveres. Answer to some questions raised in Antwerp on Isaiah LIII, 9. Text in Spanish with Hebrew quotations. f. 25r-30r: Repuesta. Answer to a reply against the above answer. Text in Spanish with Hebrew quotations. f. 31r-38v: Breve Explicação do Capitulo 53 de Jesaya. Short explanation of Isaiah LIII. Text in Portuguese. f. 39r-42v: Explicação dos versos quinto e sexto do Capitulo nove do Propheta Jessahias. Explanation of Isaiah IX, 5-6. Text in Portuguese with Hebrew quotations. f. 43r-47r: Answer to a theological question raised by Isaac Orobio de Castro. Text in Portuguese with Hebrew quotations. f. 48r-54v: Answer to theological questions raised by the academy of Venice. Text in Portuguese with Hebrew quotations. f. 55r-57r: Answer to a question raised by Isaac Orobio de Castro concerning Isaiah VIII, 14-15. Text in Portuguese with Latin and Hebrew quotations. f. 57v-59v: Discurso sobre a significação das letras Hebraicas. Discourse on the significance of the Hebrew characters. Text in Portuguese with Hebrew quotations. f. 60r-61v: Answer to a question raised by Isaac Orobio de Castro concerning the explanation of Psalm LXXII, 17 in Paulo Burgense’s Scrutinium Scriturarum. Text in Portuguese with Hebrew quotations. f. 62r-65v: Explicação do 2º Psalmo de David, verso primeiro. Explanation of Psalm II, 1. Text in Portuguese. f. 66r-67r: Answer to two questions raised by Isaac Orobio de Castro. Text in Portuguese with Hebrew quotations. f. 68: Breve discurso que fiz para Daniel meu irmão … Short discourse for the author’s brother Daniel. f. 69r-70r: Answer to three theological questions. Text in Portuguese with Hebrew quotations. f. 70v-72r: Breve discurso contra a doctrina de Calvino. Short discourse against the doctrine of Calvin. Text in Portuguese with Hebrew quotations. f. 72v-77v: Discurso em que exatamente se mostra como se compadeçem a sabiduria de Ds, seu Divino decreto, e o livre alvidrio humano: o qual compuz para corrigir a doutrina do Autor do Livro obrigação dos coraçoens novamente traduzido por Semuel Abaz, e por my coregido e reformado como consta de ditto Livro tratado do servico de Ds, capitulo 8º. Critical remarks on the book Obrigação dos coraçõens [Hovot ha-levavot] by Bahyah ibn Paquda, translation from the Hebrew into Portuguese by Semual Abaz (appeared in Amsterdam, 1670). Text in Portuguese. f. 78r: Title of Spanish treatise on rhetoric: Tratado de la Retorica dividado en ocho libros. / que coligy de los megores autores griegos y latinos / y compuze en lengua castellana para aprovechamien / to de nuestros estudiantes. f. 79r-163r: Treatise on rhetoric, divided into eight books. Text in Spanish. f. 167r-176v: Tratado de la logica menor o summulas segun la mente dinstincion de Aristoteles principe de los philosophos. Treatise on Logics. Contains a previous note (fol. 167r) and an introduction (fols. 167v-168v) before the title. Text in Spanish. f. 178r-196r: Reposta a certas propostas contra a tradição. Portuguese treatise against Uriel da Costa’s Propostas contra a tradição. Signed at the end: ‘Amsteldam, 5 de Adar anno 5499’ (=1639). f. 196v-201v: Consulta sobre o uzo das Pinturas. Answer to a question about the use of painted images. Text in Portuguese. f. 202r-211r: Two halakic responsa. Text in Portuguese with Hebrew quotations. 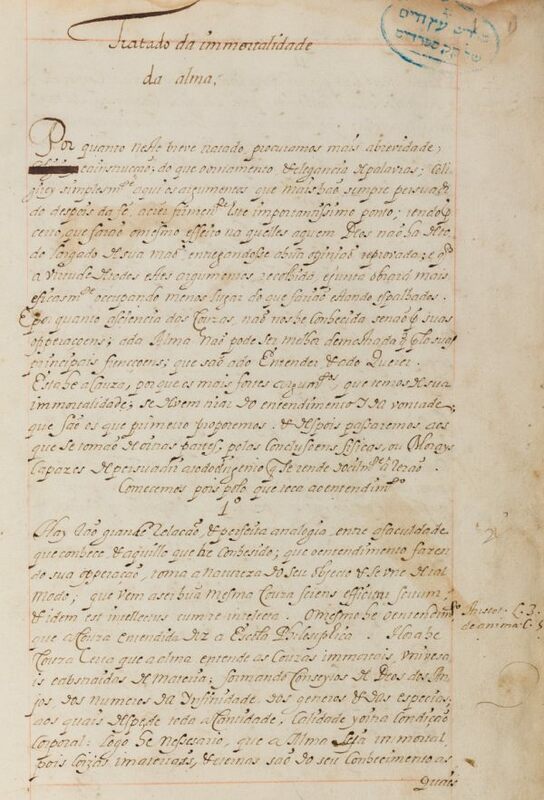 f. 213r-225r: Responsa and discourse about some questions sent from Bayonne. Signed: ‘Feito em Amsterdam a 28 de Hesvan do año 5424’ (1664). Text in Portuguese. f. 225v: Answer to the former by Manoel Isidro. Text in Portuguese. f. 227r-229v: Answer to an anonymous protestant minister. Text in Portuguese. f. 231r-256v: Answer to a treatise that an anonymous had sent from France concerning four fundamental questions of the Christian religion. Text in Portuguese with some quotations in Hebrew. f. 258r-299r: Sermão ou discurso legal. Homily in Portuguese. f. 299v-327v: Cousas notaveys de Sixto Senense que coligy do seu Livro Biblioteca Santa. Abstracts from Sixtus Senenis’ Bibliotheca sacra. Text in Portuguese. f. 329r: Title of Portuguese treatise on logics: Epitome ou compendio / da Logica. Coligida dos ma / is graves autores Gregos e / latinos, que compus em / lingua Portugueza pa / ra hum curioso e estud / ozo discipulo que carecia / da notiçia das dittas Lin / guas e sciencias. f. 329r-383v: Text. Some drawn decorations throughout the Portuguese text. At the end of the chapters some drawn decorations. f. 386v-387r: Table of contents at the end. f. 388r-424r: Tratado de la Divindad, Y eternidad de La Ley de Mosseh, coligido de la dotrina del Doctissim S.r H. H. R. Saul Levi Morteira de gloriosa memoria. Abstract of the first book of Saul Levi Morteira’s Providencia de Dios. Text in Spanish. f. 425r-436v: Explicasão do Cap. 53 de Yesaias feita no Brazil. Explanation of Isaiah LIII, written in Brazil, where the author lived from 1642 to 1654. Text in Portuguese. f. 437r-481v: Collection of biblical exegeses delivered by pupils of the author in the Sephardic synagogue of Amsterdam on Sabath afternoons in the summer of 5425 (1665). Text in Portuguese with Hebrew quotations. f. 482r-485v: Discurso sobre o estado de Adam antes e depois do Peccado. Answer to a question on Adam’s condition before and after the sin. Text in Portuguese with Hebrew quotations. f. 486: Answer to a question raised by Ishac da Silva of Antwerp about predestination. Text in Portuguese with Hebrew quotations. f. 487r-490: Answer to a question raised by an anonymous from Antwerp on Psalm CX. Text in Portuguese with Hebrew quotations. Some texts are signed at the end: “Mosseh Rephael d’Aguilar”. f. 2v, 30v, 47v, 67v, 78v, 165v, 166, 177, 211v, 212, 226v, 231, 257v, 299r, 328, 378r, 387v, 444v, 456v, 360v, 484v, 485r, 490r: blank. Belonged to the collection of Ets Haim Library at the end of the 19th century. Portuguese and Spanish, with some quotations in Hebrew and Latin / Paper / 31,7 x 20,4 cm. /  ff. (in the beginning some original pagination and signatures at the bottom of the pp. / Variety of lines to a page / Three different current Iberian hands and some Sephardic cursive writing / No title for the whole work / Text written in pencilled frame of variable length and width / Catchwords at the end of each page / 18th century leather binding, with title pasted upon the spine: ‘Tratado del immortalidade del alma’ / Some treatises are signed at the end: ‘Mosseh Rephael d’Aguilar’. Fuks 423. Fundação Calouste Gulbenkian.